with Toronto Women's Fashion Week coming to an end, I thought I would put up all my outfits from the different days. For the first day, I was honoured to wear a piece from the amazing Canadian designer Joseph Tassoni. I have always loved Joseph Tassoni because he has a very inclusive vision for his fashion, and has even designed plus sized coats available for sale at Toni Plus. For the top part of the look, I wanted to keep some structure, and a simple colour so I could show off the beautiful rabbit fur collar created by Joseph Tassoni (which will be going up for sale next week on his site). The top and blazer were originally from Addition Elle, and there is a similar blazer available on the site (click here to view), but any v-necked black tank-top underneath would have worked. 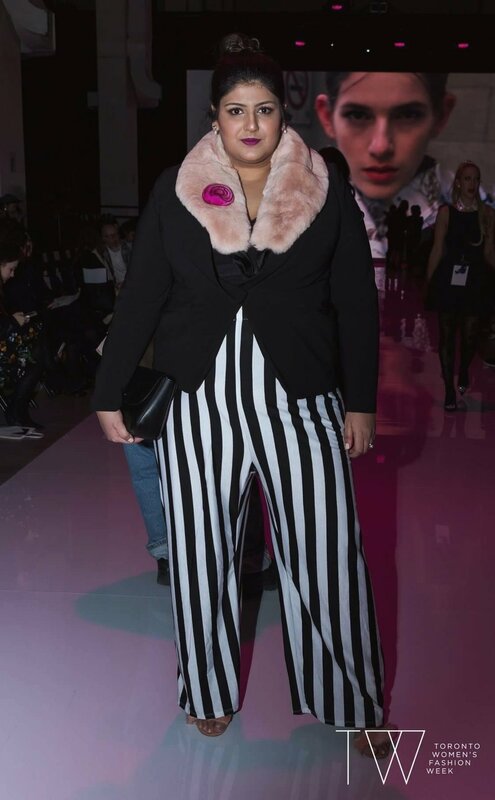 I found these amazing striped pants from Rebdolls, and unfortunately they have sold out of them, but I found a jumpsuit which is made from the same materials and has a similar fit on the site. (click here for link) I thought I needed to break up the solid black by adding a printed pant, and the black white pants were a great addition to the look. I was gifted these amazing fuzzy slipped shoes from Call it Spring. (similar pair available here) They have a short, square, block heal, and added a little bit of fun to the entire outfit. The heels also matched the fur collar. It was one of my favourite outfits from this years fashion week, and I hope you guys enjoyed it as much as I did!